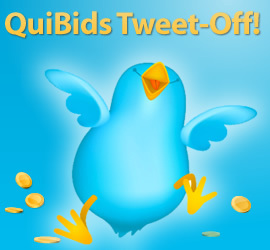 Fans and Followers of @QuiBids, get ready… get set… TWEET! This month, we thought we’d do something different and host a QuiBids Tweet-Off! One lucky guy and one lucky girl who post one of the tweets below throughout the month of March will win a $200 You Choose It Gift Card! We’d like to reward our followers who actively show their followers how great QuiBids is. And with the chance to win a $200 gift card, why not get in on the tweeting action?! Best Deal: What was one of your best auction wins on QuiBids and your savings? New Products: What new products would you like to see auctioned off at QuiBids? Gift Cards: We all love gift cards! What are your favorite gift cards to bid on at QuiBids? Tips: Tell us your favorite tip – Share it with others to help them out! QofW: Be the next QuiBidder of the Week. Why should you be QoW? Weekend Fun: What are you doing this weekend? Share the Bright Idea of QuiBids: Will you help us share online shopping’s brightest idea? Tweet this pic to your followers. This QuiBids Tweet-Off Promotion will run from March 1, 2012 to March 31, 2012. Please answer each question only once per day. Yes if you have twitter, sign up. You could be a winner. Its fun. I have won on facebook and you could win on twitter. YOU CAN WIN. EVERYONE HAVE A CHANCE. Tweet, tweet, diladee doo, that’s where it’s at !!!!! I take to much time on QuiBids, but it is fun. I love QuiBids because I bought everyone their Christmas gifts last year and their birthday gifts onthe site. If I didn”t win the items, I paid for them using the bids that I had already used so the price was extremely low!!! My friends and family were soooo surprised at the name brand gifts they received from me over the past year and a half! I have tried to talk them into signing up so I can get better gifts from them and a few of them have signed up, but they are only interested in winning great things for themselves so far…..oh well maybe they will win or buy me something great this year on my birthday or perhaps christmas. I can dream…right??? I am new to QuiBids but so far I’m enjoying it very much. Love what they auction off. I’ll just see how QuiuBids goes for awhile. I’m very much looking forward to being a longtime member. Why thank you, Cyndi! We sure are glad to have you! Quibids you made my girlfriends Christmas cause I won enough Sears Travel cards for our Southern Caribbean Cruise! I just tweeted my answer about wanting to see more music equipment and instuments on Quibids. I see the tweet on my home page, but nowheres on this page. Did it make it into the contest? Tweet, Facebook, Tweet, Facebook — maybe someday it will pay off??? Tweet Tweet!!! Tweet, Facebook, Tweet, Facebook. Tired of tweeting, tired of Facebook, but sure would like to win some free bids!! !